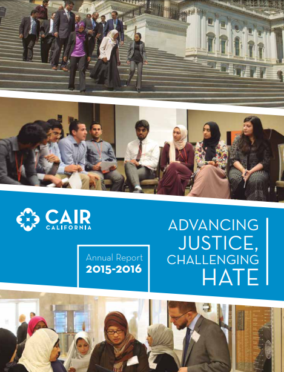 However, frequent hate and discrimination incidents remind us of the necessity of CAIR-CA’s continuing work and your support in creating a more just and equal society. In November and December 2015 alone, American Muslims witnessed an alarming 34 attacks against our houses of worship nationwide. Moreover, the climate of anti-Muslim bigotry is being fueled by a multi-million dollar Islamophobic industry. According to our latest Islamophobia report,“Confronting Fear: Islamophobia and its Impact in the U.S. 20132015,” an inner core group of 33 organizations was funded by an astonishing $200 million-plus between 2008 and 2013.
engagement in the fabric of our nation.